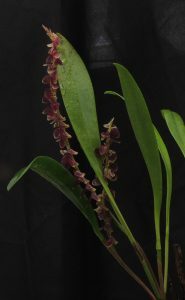 The last in our group of Stelis species is probably our most floriferous. 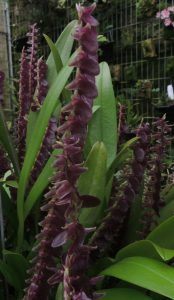 The name ‘nexipous’ means duck’s foot and describes the shape of the flowers which is unlike any other stelis in our collection. 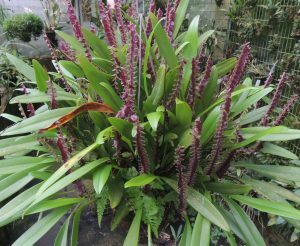 The dense spikes are very upright and secund (all the flowers facing one way) giving a dramatic display that lasts for several months. The species is native to Ecuador and Peru where it is found in forests from 700-2400m and as less of a cloud forest specialist than some of the genus it is a strong rooting plant and robust species to grow. We have several young plants coming on well and their attractive flowers will be a feature in Cool Americas for a good while to come. We have a little Stelis which says Stelis sp.Costa Rica ‘Little Gem’ on a green label. I can’t find this orchid on your website. I think we bought it from you at Budleigh Salterton. Please would you tell me something about this orchid such as how much and how often it needs to be watered, how much light it needs and how warm it needs to be? When, if we look after it properly, it might flower?